Do you love cowbells? Do you love to laugh? Do you think $1 is worth a chuckle? This game is for you! Don’t take the term “game” too seriously though. In fact don’t take too much too seriously in this game! 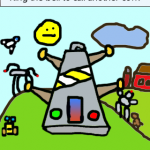 It is just for fun. Give it more time then you think though! There are more then 10 bells to unlock! The story: You are sent to your uncles farm for the summer. 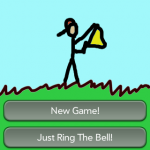 You and your cousin Dave encounter many adventures over the long summer… but nothing a little bell ringing can’t solve! 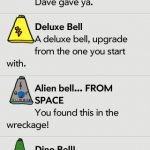 After you unlock the bells, you can pick which ones you want to use in the settings. You can also shake the phone to ring the bells! PLEASE NOTE: The palm sound object is slightly slow right now, when they fix it, or when I find a way around that issue, I will update it for free. Until then, bells may seem to ring a bit slow, especially if you have a lot of apps open. 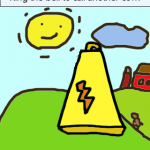 One of the many special bells in the game. Another one of many different bells. Replay the game again, with any bell you have unlocked. 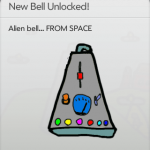 An alien bell, with alien sounds.